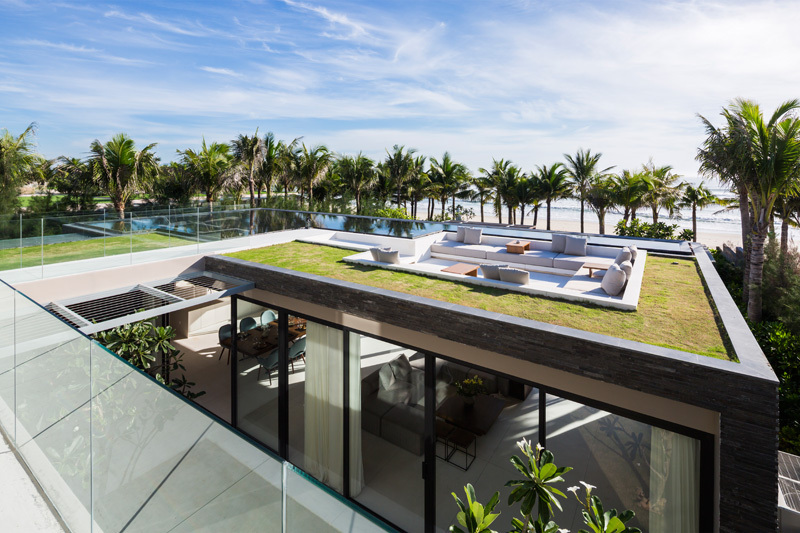 How about a tropical modern home with a rooftop lounge? If you have a modern home with a tropical feel, it is like you are always in vacation, right? For sure you will agree with me. And it would be very much fulfilling to have a house like this one- complete with the comforts of modern living and has that refreshing tropical aura that anyone would like to have. We have featured many homes with this design and they all hit the mark of excitement and would fire up that dream of having a beautiful house. What we have today is an amazing residence with modern architecture and interior surrounded with breathtaking landscaping that no one can ever resist. 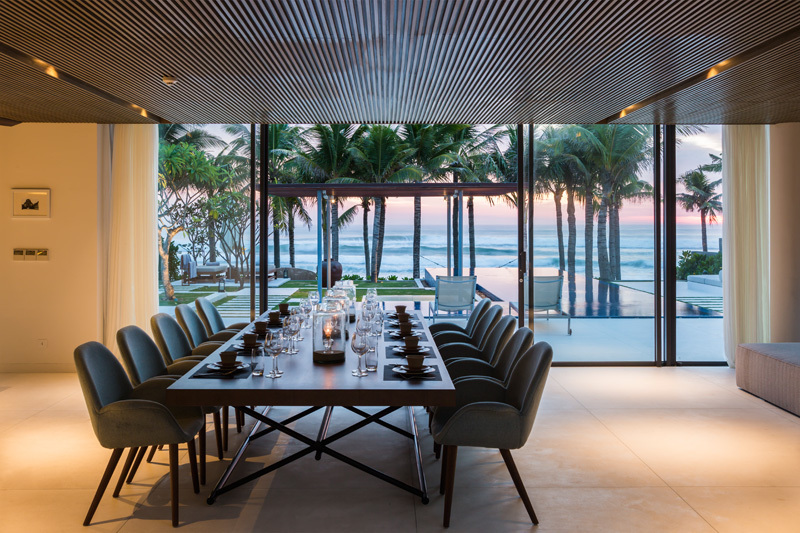 The MIA Design Studio designed one of the villas that are part of the Naman Residence project, located on Non Nuoc Beach in Vietnam. The look of the house is very attractive and very inviting from the outdoor design to the interior as well as the home’s architecture. But if you will ask me, I love the outdoor space so much especially the pool area and that lounge space above the roof surrounded by green lawn- yes, it is on top of the roof! I know you are amazed with the mere thought of it. You will surely be more impressed when you see the actual photos of the home. Let us take a look at it below. Unique feature: A modern beach house with a tropical feel has a relaxing pool area as well as rooftop lounge where family and friends can party all night and day! 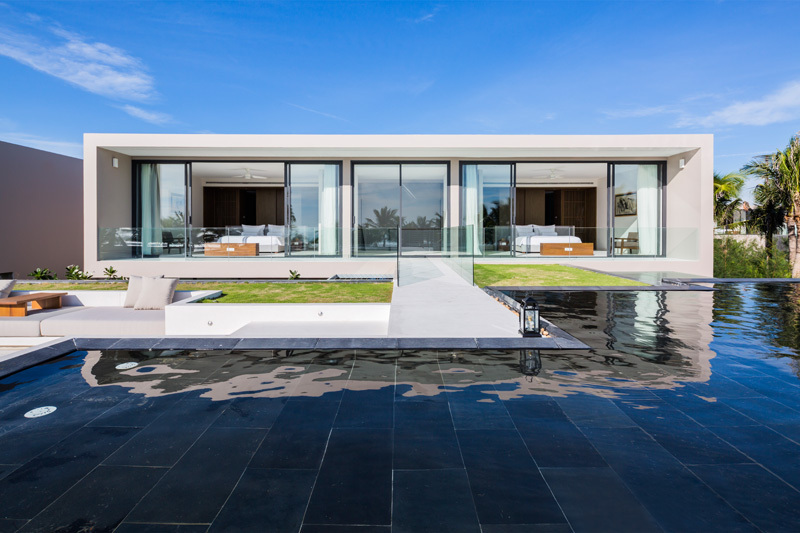 The house doesn’t just have a stunning architecture with sleek and geometric lines but it also has a very inviting pool area and landscaping. 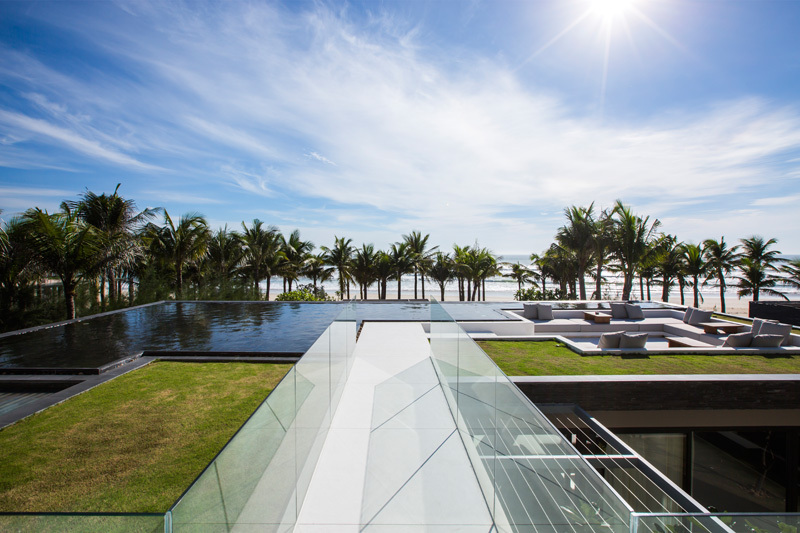 Notice the infinity pool that has modern landscaping around it. Aside from that, there is a pergola that shades a part of the pool where hot refreshing water is provided. This is the upper part of the house with the rooftop lounge. Yes, it is just simple with a rectangular modern design and glass sliding doors. But inside it and around it, you can see high quality furniture, glass fencing and the views, oh the views! No one can ever resist the views from here. Told you so. I told you the views from the house are very breathtaking and mind-blowing! The palm trees that dance with the winds from the beach could add that refreshing feel all over the place. And all this can be seen not just from the rooftop but even from the home’s interior. The rooftop is one part of the house that definitely makes me fall in love with it even more. It is a good idea to use glass fencing because it doesn’t obstruct the beautiful views of the beach. Under the rooftop is the interior space that contains the living area, dining area and others. You can see here the dining area right from the open sliding glass door. 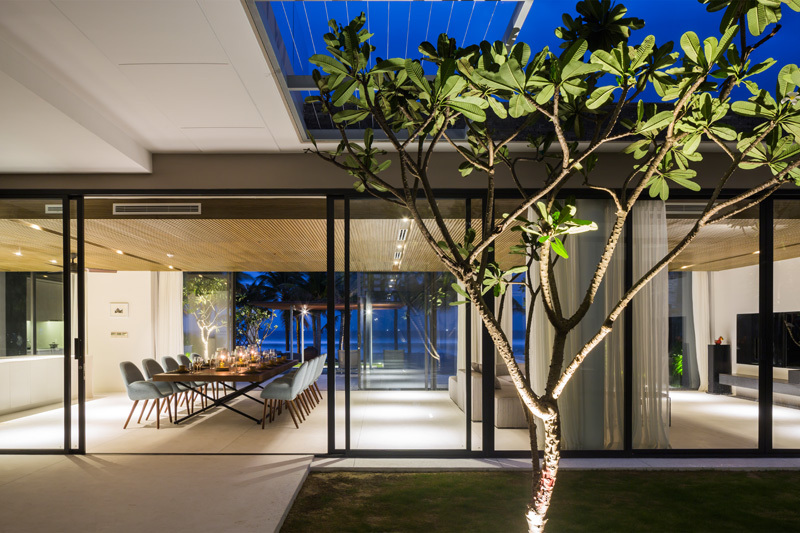 Notice that the house has glass on both sides creating an open feel and fresh aura. 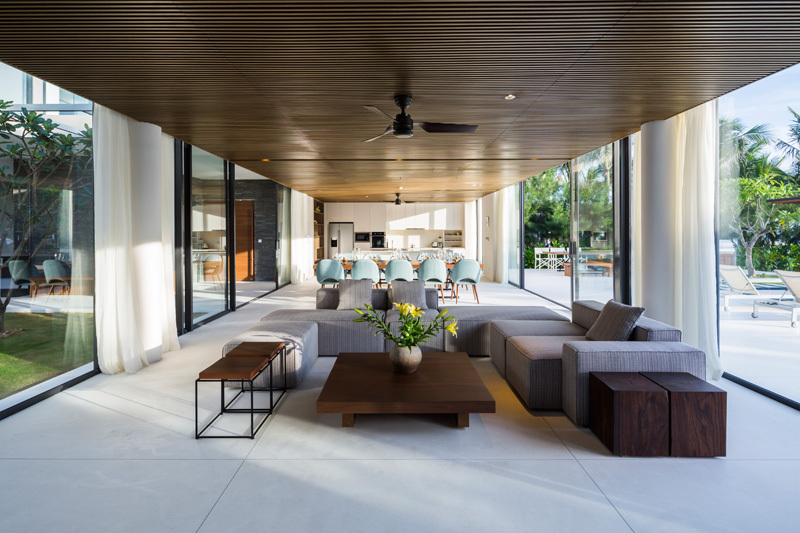 Wooden ceiling is used in the house with an open layout. Glass windows and sliding doors are around it that brings in a significant amount of light as well as good ventilation. Just imagine the feel of the ocean’s winds. Seen here is a gray section sofa with wooden coffee table and ottoman. Since the area is already well-ventilated, it used a ceiling fan for every area just like what we saw in the living room. The dining area has a long wooden dining table and comfy light blue chairs with wooden legs. A closer look of the dining space where you can see the combination of materials used for the dining table. I also like the way they designed the ceiling as well as the views, of course. Well, everyone would love that view. Oh what a beautiful sunset! 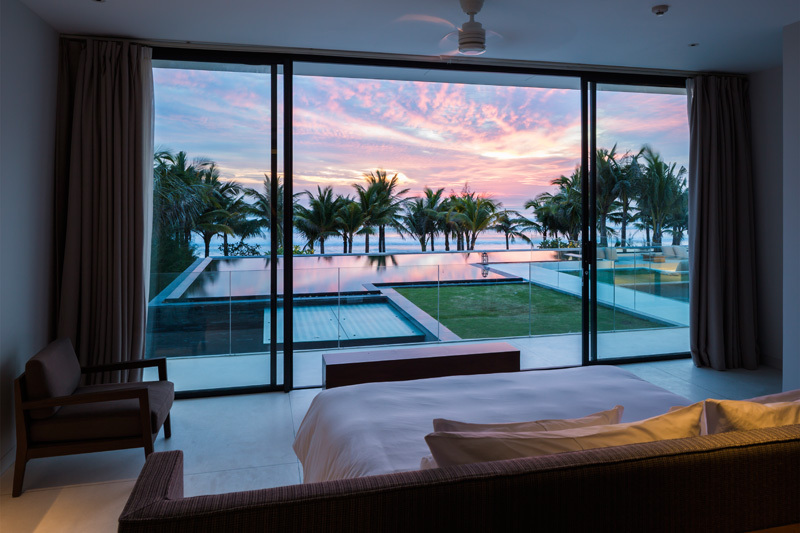 Each day, the owners are treated with this stunning panorama from their bedroom. It has thick drapes that can be drawn close when privacy is needed. This is another bedroom in the house with a very relaxing feel. 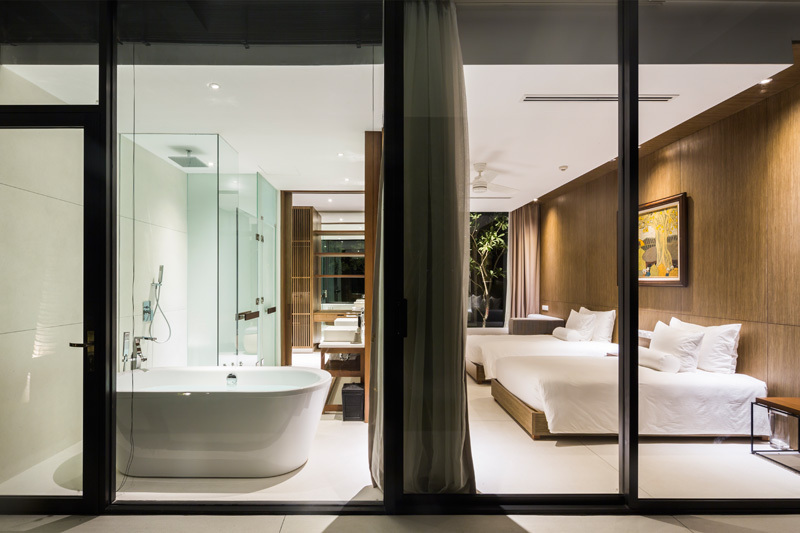 It has its own bathroom that is also surrounded with glass. I can sense a spa feel in the bathroom and a Zen feel in the bedroom. Isn’t this an amazing place to rest and sleep in? Sure, it is! 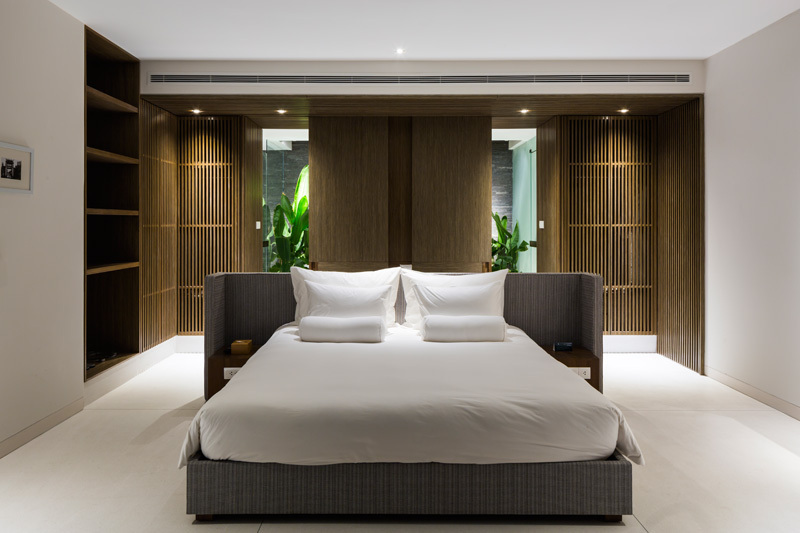 Another bedroom in the house with a beautiful bed design equipped with storage and side tables. It has a wardrobe too and an ensuite that is surrounded with glass. Notice that there are tall green plants in the bathroom. And this is the bathroom with a spa and Zen aura as it used wood and added some plants into it. It is really refreshing to have plants in the bathroom. Agree? I know you will say yes to that! A textured wall is covered with gray stone. Definitely stunning indeed! I know you will agree with me because obviously, this house has a very impressive modern design. But what makes me fall in love with this is the tropical aura all around the area from the outdoor space to the interior of the home. Of course, we will not miss the rooftop lounge too. This house is designed by MIA Design Studio and with the looks of it, you will surely be impressed on how the home turned out. Amazing house indeed! I want a home similar to this one because it isn’t just the tropical and modern fusion that amazes me the most but also the mesmerizing views around the home. No wonder why many people loves to live near the beach! It would be awesome and very relaxing to wake up with the fresh smell of the beach and the sound of the waves. So, what can you say?